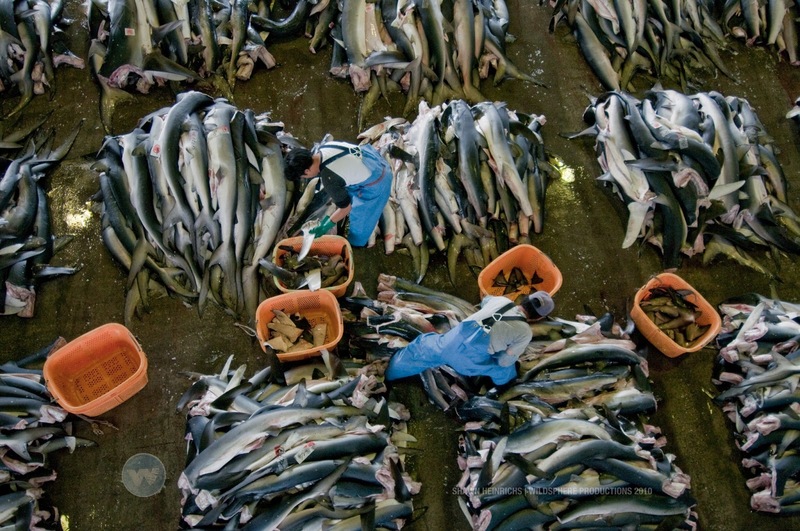 Shark Defenders: This Is Sustainable Shark Fishing? These photos were taken in Kesennuma in Miyagi prefecture in Japan. 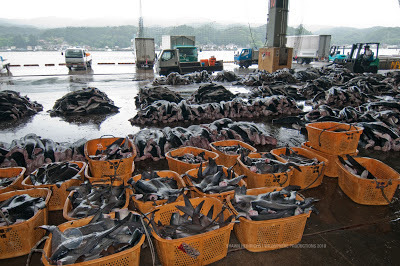 They show blue sharks being landed. This is a daily scene. Kesennuma is in the media today. 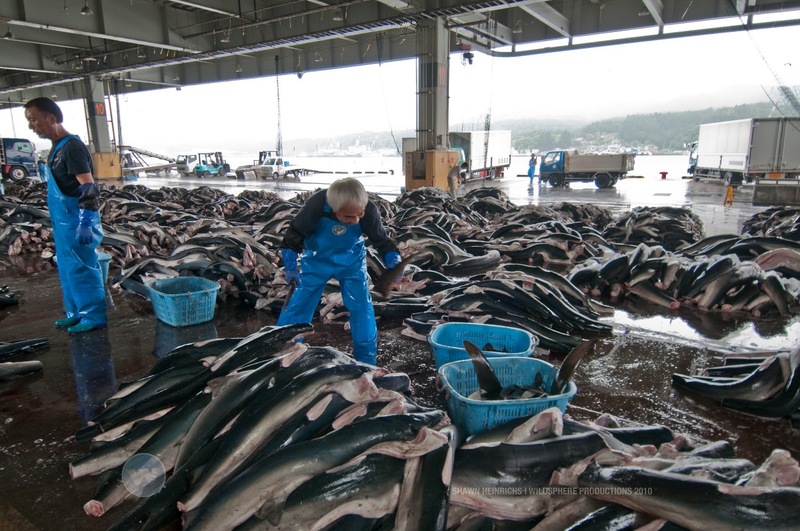 In response to protesters demonstrating against the sale of shark fin soup outside their stores, Muji, a retailer in Japan, has issued a statement announcing their intent to continue the sale of the soup. Muji's gives three reasons for ignoring the protesters. They argue that (1) sharks landed at Kesennuma, where they source 70% of their fins, are landed whole and are not finned, that (2) blue sharks are not threatened with extinction, and that (3) there are no regulations for the fishing of blue sharks other than banning finning, which is not occurring at Kesennuma. 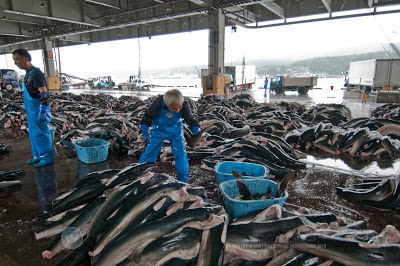 They go on to state that they are supporting the shark industry in Kesennuma because they are a local industry and to support victims of the 2011 earthquake and tsunami. So is this sustainable? The lack of regulations does not necessarily mean that they are not needed. Muji may be following the rules, but they could do more to change them. 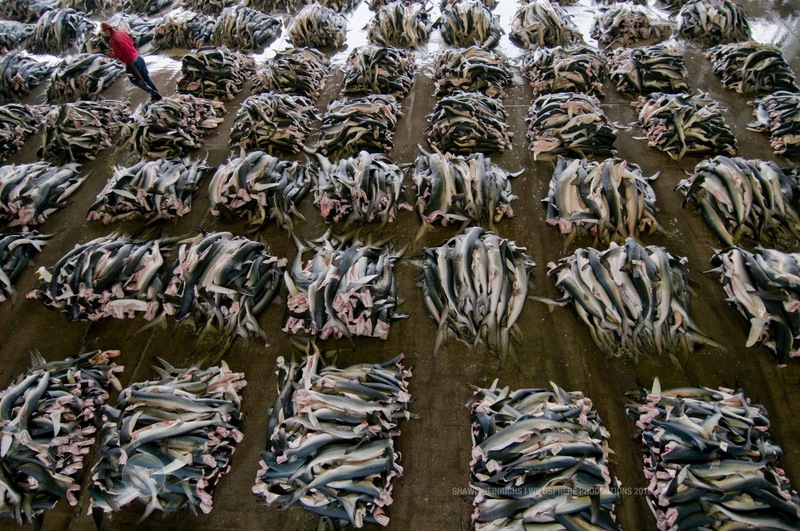 Just as worrying, in their press release, MUJI declined to comment on one of the key messages of the anti-shark fin soup campaign: that consumption of the very high levels of mercury in shark products could seriously damage unborn children. Japan was the site of the most horrifying example of this when Chisso Corporation dumped mercury-infused waste in the local water system and ruined tens of thousands of children's lives. The US FDA guidelines state that pregnant women or hopeful mothers MUST avoid shark and swordfish products to protect their babies. MUJI, knowing full well that the Japanese public is especially sensitive to the issue of Minamata Disease, declined to comment at all on the mercury matter in their press release. 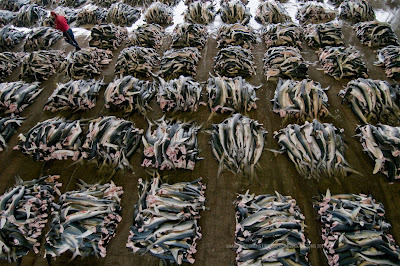 Further, though they claim whole sharks are the source of their shark fin soup, the numbers landed at Kessenuma are very high, surely contributing to the global shark population decline. And for a self-proclaimed 'eco-company' like MUJI (they trade strongly on their image as environmentally friendly) the utilization of any species on the IUCN red list should be an absolute no-no. It contradicts everything they claim on their website about Corporate Social Responsibility. So, too, does their argument that many of the sharks are by-catch from long-lining, a technique that indiscriminately kills dolphins and turtles, too. Since Sunday's protest outside their flagship store, it now seems they have contacted right-wing groups in Japan to begin harassing the campaign organizers with aggressive and hate-filled messages online. In fact, the outpouring of right-wing aggression and hate towards campaigners so upset one of the figureheads of the movement that her facebook page had to be taken offline temporarily and she has some fears for her personal safety. All in all, MUJI have demonstrated that, when it comes to profit, they are no different from any other Japanese company, despite heavily promoting a public image to the contrary. Claims of being environmentally friendly have now been revealed as a cheap and simple exercise in PR manipulation. 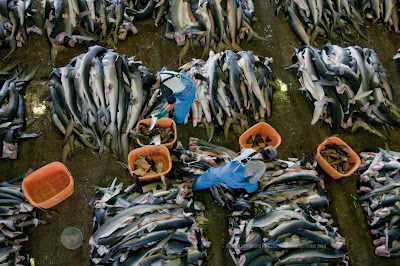 The struggle to end their complicity in the shark-slaughter continues.